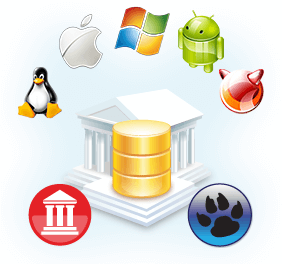 SQL Server Data Access Components (SDAC) is a library of components that provides native connectivity to SQL Server from Delphi and C++Builder including Community Edition, as well as Lazarus (and Free Pascal) for Windows, Linux, macOS, iOS, and Android for both 32-bit and 64-bit platforms. 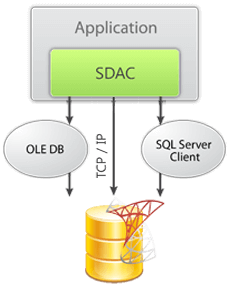 SDAC-based applications connect to SQL Server directly through OLE DB, which is a native SQL Server interface. SDAC is designed to help programmers develop faster and cleaner SQL Server database applications. 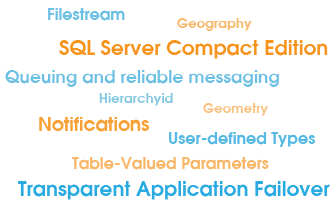 SDAC supports a wide range of SQL Server specific features, such as Transparent Application Failover, Notification, Queing and reliable messaging, SQL Server Compact Edition, User-defined Types (including HierarchyID, Geography, Geometry), Table-Valued Parameters, Filestream, and others. SDAC is a cross-platform solution for developing applications using various IDEs: RAD Studio, Delphi, C++Builder, Lazarus (and FPC) on Windows, macOS, Linux, iOS, Android, and FreeBSD for both x86 and x64 platforms. SDAC also provides support for the FireMonkey application development platform, which allows you to develop visually spectacular high-performance desktop and mobile native applications. We provide various GUI tools that will increase your productivity: dbMonitor allows monitoring activity of your DB applications, Dataset Manager simplifies DataSet and DB controls tweaking, and others. Allows your application to work with SQL Server directly via TCP/IP without involving SQL Server Client, thus significantly facilitating deployment and configuration of your applications. Development for iOS and Android mobile devices using SDAC becomes still easier, as SDAC allows your mobile applications to work with SQL Server database as simply as desktop applications do. 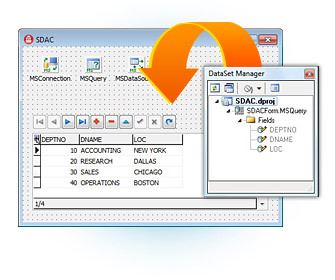 If you want to make custom correspondence between SQL Server and Delphi data types, you can use a simple and flexible Data Type Mapping engine provided by SDAC. Use our freeware dbMonitor tool to monitor and analyze all the DB calls made by your application using SQL Server data access components. dbMonitor performs per­component tracing of SQL statement execution, commits, rollbacks, etc. SDAC component suite gave us opportunity to provide our customers with trouble-free and efficient database access in our software solutions. Since we began using Devart DAC components, our development time shortened drastically, since we can focus on the application instead of data access. Some clever solutions, like macro parameters, gave us widened programming options which help us satisfy our customers more efficiently. Devart's devotion to keep up with database server developers warrants us security and helps us stay in business. We do actually use SDAC, MyDAC, IBDAC and ODAC, in some of our software solutions we use even more than two of them at the same time. I personally think that Devart's DAC libraries for Delphi were our best buy, and helped us a lot in database applications development. Mr. Davor Tavcar, head of Development department, Storitve Tavcar in partnerji d.n.o.